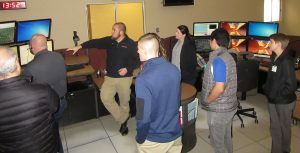 Leadership Wyoming team members participated in tours of the county’s emergency operations center, prison, and courthouse on April 4, making up for a day missed in February due to snow. 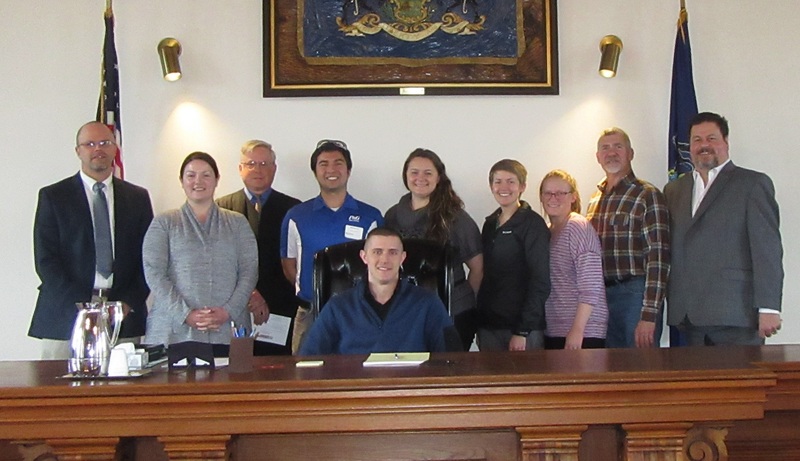 While at the Wyoming County courthouse, they had a chance to enjoy a perspective of famous courtroom #1 usually reserved for President Judge Russell Shurtleff (standing, third from left). Shurtleff and District Attorney Jeff Mitchell (far left) presented an overview and fielded questions about the judicial system. Commissioner Tom Henry (far right) conducted the tours. Leadership members included (continuing from left) Kimberly DeLeo, Michael Gomez, Alisa Shaffer, Kelly Langan, Bonnie Nemergut, Rick Hiduk, and (seated) Phillip McKeon. Above, Wyoming County 911 director Jeff Porter (third from left) and deputy 911 director Frank Miller (seated) work through a simulated 911 call and response. The group is scheduled to meet again on April 18 for Economic Development Day.